Coolum Surfing School is located on the naturally refreshing Sunshine Coast, only 90 minutes north of Brisbane and 10 minutes north of the Sunshine Coast airport. The Sunshine Coast offers some of the warmest water in Australia, where you can surf all year round seven days a week. Learn to surf with one of Coolum Surfing School's local and professional surf instructors all very experienced and competent surfers whose passion is passing on the "stoke" of surfing. Coolum Surfing School is a family owned and operated business since 2001. They specialise in private surf lessons with a maximum of one to eight ratio. They cater for everyone's needs - individuals, families, school camps and even stressed out corporates who want to wash away their worries. All equipment including wetsuits is supplied so all you need is a towel, swimmers and a smile! 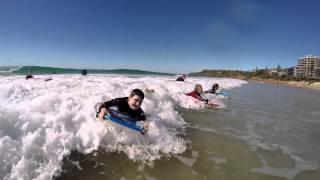 Coolum Surfing School use safe soft learner boards, and have a vast range of boards to suit all types of body sizes and abilities. Give yourself the thrill of a lifetime and enjoy the natural high of surfing while also having a great physical and fun work-out! Join in their two hour Beginner surf lesson, available every day from 10am to 12noon and 1 - 3pm. During this lesson you learn the basics have you standing up in no time and having some fun in the surf. They will supply all equipment so you will just need swimmers and a towel.